As an antique dealer--this is probably the question that I get asked the most--mainly by people who are not in the business. Friends, acquaintances, friends of friends, neighbors--at some point in our lives almost everyone is given or inherits an item and wants to know how much it is worth. This is probably the most difficult question to answer--worth to whom? What is it worth to the family who inherited Grandma’s rolling pin? The same one she used to roll out her beloved Christmas cookies each year? To the family it is priceless. To sell a 1930s wooden rolling pin in a antique mall--maybe 15 bucks--if it does not have old dried up hunks of cookie dough adhered to it. 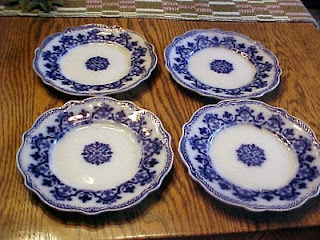 What are my English flow blue plates worth? Ask me in 1990--and I would have said--send your kid to Yale on the selling proceeds. Today--depending on pattern and condition--you will be darn lucky to get 20 bucks each. Flow Blue is out of favor now. How about my great Eastlake Victorian commode? Certainly this piece that was passed down through the family since its manufacture in 1880--CERTAINLY has to be worth alot. After all--its OLD. Victorian furniture was hot hot HOT in the 1980s--now today’s home making public wants sleek lines and not fussy--and it is out of favor. I have seen all wood Eastlake style dressers go at auction for 100 bucks. Tops. Trust me--old doesn’t make it valuable. Condition in whatever you are looking at means everything. EVERYTHING. I once heard a rule of thumb--the more recent the item the better condition it has to be in. In an increasingly visual society--what people see adverts, television, movies and in magazines is key to what is currently in vogue. Believe it or not--when Martha Stewart shows it--it still sells. Many times Husbola and I will be at an auction--and we are stunned at what an item brings--either very high or very low. So in the auction world--and item is worth what two people in the same room would pay for it. This can be fueled by poor auction attendance or whether it is an estate piece and family members are in hot pursuit. When asked by someone--”What is this worth? I actually would like to run and hide. Your guess is as good and mine--and we are both frequently wrong. Husbola asks me that question-- alot. And often, really often when we are doing something antique business related and especially when we are experiencing extremes in weather and temperature and are getting ready to exhibit and sell at an antique show. In November each year--Husbola and I review what antique shows we sold at earlier in the year--those that were successful and which were not. We pull out our calendars and decide which shows will be "keepers", whether we will add any new shows to the schedule and if there are any we wish to dump. (The criterian for adding or dumping a show will be the subject of another future post). In November--a few months removed from our last show--ALL shows for the upcoming year look fresh and new and interesting and we start submitting contracts and booth deposits. Then the inevitable happens. A month before a show--we need to start putting together the inventory--and the dash to fill in inventory holes begins. Where will we get fresh, innovative goods that will fit the current buying trends of today's customers? Can we get it prepped (cleaned/repaired) priced and ready for the show in time? How do we price it this year--so that is sells after one or two showings only? When do we pack the truck--will it all fit--are we taking too much--too little--what is the booth set up strategy? When will we make hotel reservations, stop the papers and mail, get enough currency for change? Do we have all the supplies-extra alight bulbs-booth rods and curtains-lights--supply bucket? Have we sent show cards to customers, have enough reciepts and business cards and fresh shopping bags and tissue paper and bubble wrap? The list is long. Show set up day arrives--and inevitably it is hot. Humid maybe. Maybe REALLY humid. We hate humid. Once the booth is set up--and Husbola and I have co-existed and everything is ready--we wonder--remind me again why we are doing this? When the 1 out of 100 customers is a real jerk shows up--and tries to buy something for nothing--remind me again why we are doing this? When sales are under expectations and it comes time to packing this all up again--remind me again why we are doing this? Because we love it. Will we ever be able to support ourselves on our sales? No. But antiquing is something Husbola and I love--have been doing most of our lives and certainly our almost 28 years of knowing each other lives. Our first date was an antique show. Our house has two modern things in it--a television--and I can't remember the other thing. Remind me again why we are doing this? Because we can't help it. After a long day of trudging around and antiquing, whether we are browsing shops or a flea market or attending a show--we get a bit "peckish" and want to sit down and have something to eat. After all-you need strength to carry on for the rest of the afternoon. The Brits really have the right idea--many antique centres have a "tea room" someplace in the building--frequently on the top floor. Usually somebodies sister-in-law works with a girlfriend to make "freshly cut sandwiches" or a "jacket" (baked) potato to offer shoppers. There might even be a few lopsided layer cakes under glass domes. You can always count on mismatched china and cutlery and a fabulous pot of tea--just the refresher needed. And why do sandwiches always taste better when someone else fixes them? British antiques fairs that are held in showgrounds always have purpose built wagons-each with a specialty--cornish pasties, a carvery (mystery meat whacked off big bones) or our favourite--the toasty wagon. This is the British version of the panini--just the ticket for a ravenous shopper--and all the best if consumed when it is brisk outside--at a picnic table with a cuppa tea. Now--our American antique promotors could take a lesson here. It is quite hit or miss--and mostly miss-and not healthy food. Fried stuff-greasy stuff and lots of orange plastic nacho cheese sauce. Think ballpark food but not as colorful. One of our regional auction houses conducts auctions in a large warehouse building. The food concession is offered by a man in a motorized wagon that he pulls into a huge loading door. Dan and I usually take a thermos of coffee and our own "freshly cut sandwiches" or granola bars. But this particular wagon offers Mrs. Mike's Potato Chips. RETRO POTATO CHIPS. These are made in Freeport Illinois and are like chips used to be made in the 1960s. And they taste like the 1960s. Three ingredients--and you can pronounce them all. So--if being at an auction and bidding on and buying old things doesn't transport me to my childhood-- then munching some Mrs. Mike's chips sure does.